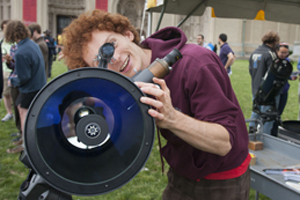 Using high-powered telescopes and special eclipse glasses, astronomy enthusiasts, including Tyson Price, a senior in physics and an astronomy club member, gathered on the College of Fine Arts lawn on Tuesday, June 5, to try to track Venus as it crossed the face of the sun. However, the overcast Pittsburgh skies didn’t cooperate and most of the planet-seekers watched NASA’s live feed of the Venus transit on six large screens in a new computer cluster in Wean Hall. The event was organized by the Physics Department’s Diane Turnshek, Michelle Ntampaka and Nick Battaglia. If you missed the action, you’re out of luck. The next transit of Venus won’t happen again until Dec. 11, 2117.